Below you will find our range of multi point door locks, separated into different brands. As most people are looking to replace an existing unit we recommend first finding the brand and type of fixings the unit has. After which obtain the backset & centre measurements for the lock, these are then documented on each product so you can compare. If you are finding it difficult to gauge which lock you need, or cannot find the direct replacement please get in touch and we will be happy to assist you. Range of versatile replacement locks for the majority of multi-point locks on the market today. Avocet multi point locks, range of hooks/deadbolt with rollers. 62mm or 92mm centres designed as a replacement mechanism. ERA multi point locks, range of hooks with rollers. 92mm centres designed as a replacement mechanism. Ferco multi point locks, available only with rollers. 70mm centres designed as a replacement mechanism. FUHR multi point locks, range of hooks with rollers. 92mm centres designed as a replacement mechanism. 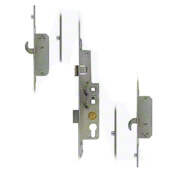 Fullex multi point locks, 68mm centres designed as a replacement mechanism. Range of GU multipoint locks. Standard mechanical and Electronic locks available. KFV multi point locks, available with rollers. 92mm centres designed as a replacement mechanism. Lockmaster multi-point locks available with hooks, deadbolts or rollers. Suitable as a replacement lock with 92mm centres and 35mm backset. Maco multi-point locks available with hooks or rollers. Suitable as a replacement lock with 92mm centres and 35mm backset. Safeware multi-point locks available with hook and rollers. Suitable as a replacement lock with 62mm / 92mm centres and 35mm backset. Winkhaus multi-point locks available with hooks only. Strong against physical attacks. Suitable as a replacement lock with 92mm centres and 35mm backset.